Summary: To maintain its leadership as Austria’s most extensive academic institution, the University of Vienna looked to overhaul its Current Research Information System (CRIS) with a solution that would be well-accepted and easily utilized by its researchers, the library and the administration. 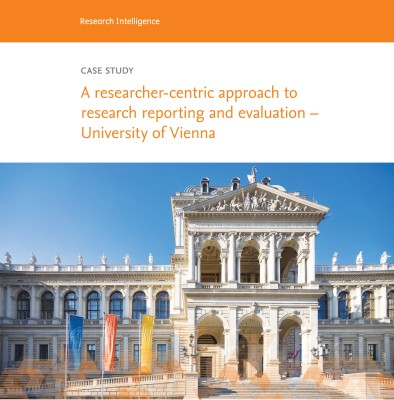 To meet reporting requirements mandated by the Austrian government since 2006, it was imperative for the university that the chosen research information management solution provided capabilities that could adapt to the institution’s evolving needs and requirements. Challenge: The University of Vienna’s in-house CRIS solution is called Research Activities Documentation (RAD), which ran from the time of the mandate in 2006 to 2012. Through the years, demands of the system had evolved and its user experience needed to be more sophisticated for greater efficiency. These factors, coupled with the fact that ongoing maintenance and further development were becoming prohibitively expensive, led to the university’s decision of looking outward for a more suitable solution, with the needs of the users placed in top priority. At the same time, the university kept in mind that the statutory requirements had to be met, and that research-related data had to be transparent with data quality maintained. Solution: During the evaluation of suitable CRIS solutions, Pure stood out from its competitors as a dedicated system built for academia. The Elsevier team also had vast experience in system implementation, and could assist in deploying the solution for a broad scope of activities. At its core, Pure manages research and researcher-related data with a user-friendly interface. Its well-established framework also encompasses components for administration and processing, further future-proofing the university from ever-changing demands with flexibility and scalability. The successful synchronization of master data from the campus management system and the migration of legacy data gave rise to a centralized database for all of the university’s research-related information, resulting in trusted, comprehensive and accessible data in real time. Also, being committed to maintaining high standards of data protection and security as its top priority, the university found it was able to host Pure and store all its data in its internal servers. Pure is a solution that extends beyond the organization and accumulation of data. It has played a vital role in identifying the value in our institution’s research output and increasing our institutional visibility. Impact: Pure makes it possible to authenticate the validity and reliability of research information, improve visibility of the institution’s researcher profiles and data on the open web, and log research data with greater ease since data only needs to be entered once (even across multiple projects). Pure has given the University of Vienna both a more panoramic and granular view of its internal environment, and equipped it with improved data collection to drive strategic business decisions. By enabling decentralized data registration, Pure also gives researchers full control over their data and profiles, as it helps them submit their data with greater ease. Developing an in-house solution is not cheaper than having a system like Pure, which is designed to support and manage many different aspects of research. You can’t develop this in-house with normal IT services – this is an expert system.